Arcade Fire's Win Butler and Régine Chassagne are once again gearing up for Krewe du Kanaval in New Orleans, and to help usher in the event, they are lending their skills to a reimagining of the classic "Iko Iko." Butler and Chassagne have teamed up with Haitian artist Lakou Mizik, 79rs Gang and the Preservation Hall Jazz Band for "Iko Kreyòl," which presents the Mardi Gras standard "Iko Iko" in some new light. In this retelling, Lakou Mizik and 79rs Gang trade off new verses in Haitian Kreyol and English that celebrate the epic cultural reunion of Haiti and New Orleans. The glory and connection of these cultures are on full display as the traditional Haitian rara horns mix with second-line swagger. By the end, the song winds its way back to its original homeland, Haiti. 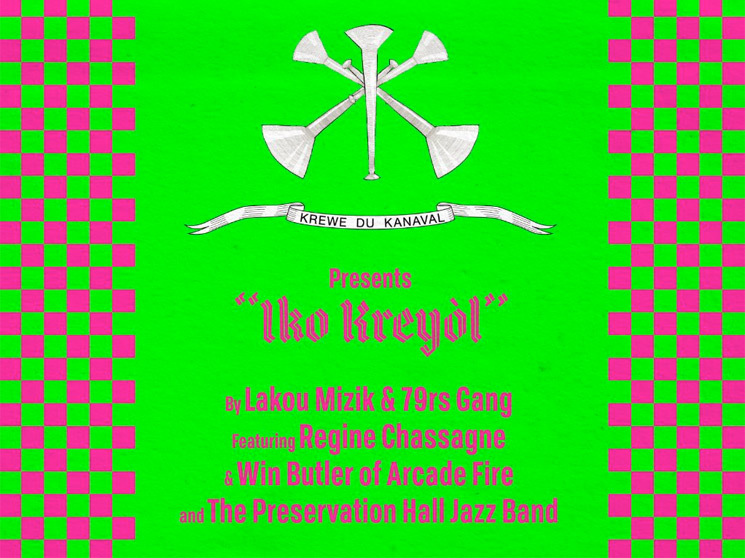 "Iko Kreyòl" was recorded both in New Orleans, Louisiana and in Jacmel, Haiti at the Artists Institute and is produced by Butler and Eric Heigle. Down below, you can listen to "Iko Kreyòl," as well as a second mix by Butler as DJ Windows 98. Krewe du Kanaval will take place on Friday (February 22) in Louis Armstrong Park at Congo Square in New Orleans. It is free and open to the public.